The Decred (DCR) crypto currency is still fairly new and although it needs more work to become a more user friendly altcoin things are already happening with the latest useful addition being the website DCRstats. 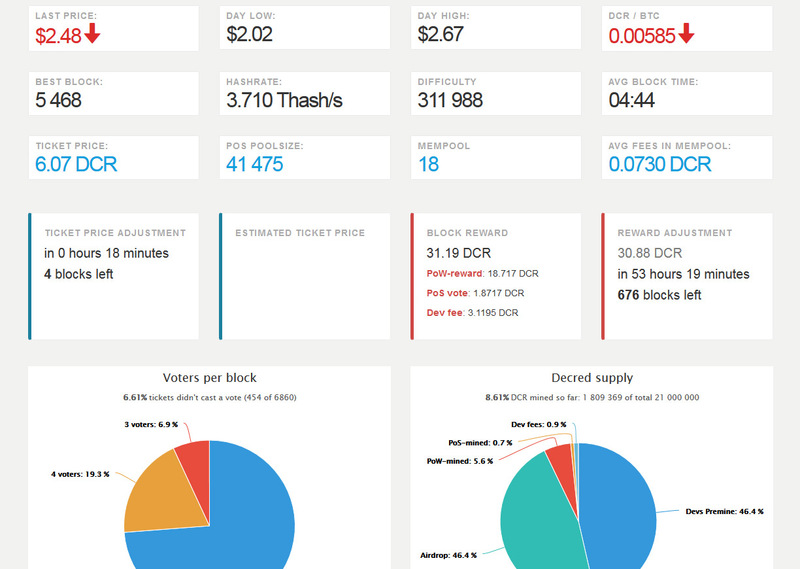 A single page website that presents a lot of useful information to help you keep track of what is happening with the Decred network at the moment – how is the price changing, what s the current difficulty and network hashrate, the average block time, the ticket price for PoS, how is the block reward distributed and how and when it will change and some more useful graphs and charts. You may even get some useful advice such as to not buy tickets for PoS at the moment, because the price is high and how much time you will need to wait for the next PoS difficulty adjustment to get a better price if you are staking Decred coins. So in short a website to keep a track of if you are mining, trading or just interested in how things are moving on with Decred (DCR) or to get a quick and good overview of the current situation. The best of all is that the project is open source, so you can check the code on GitHub and maybe even help in further improvement and development to make it even more useful and practical than it already is.